Chairperson Catherine Livingstone will use today’s AGM to confirm Commonwealth Bank’s exit from investment in coal. The statement is in response to pressure over the bank’s management of climate change, including a shareholder resolution that would have embedded climate risk management into the constitution of the company. “Commbank’s exit is one of the starkest indicators yet that coal has no future,” said Market Forces Executive Director Julien Vincent. According to Market Forces, today’s statement effectively codifies what has already been evident in the bank’s lending practice over the past three years. Whilst CommBank was involved in re-financing the Newcastle coal terminal in July 2017, its most recent new lending to a coal project dates back to a November 2015 AU$30 million corporate finance package for Macmahon, which included support for its Tavan Tolgoi coal deposit in Mongolia. A major test of today’s statement will be when Adani’s Abbot Point coal port comes up for refinancing, due in the next 12 months. Commonwealth Bank is the most exposed Australian bank to Abbot Point, which is fundamental to Adani’s prospects of developing their Carmichael mega coal mine. 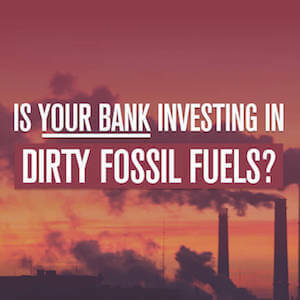 Research from Market Forces shows since CommBank first committed to support the goal of holding global warming to below two degrees in 2015, it has loaned $6 billion to fossil fuels, more than four times its renewable energy lending. It has also financed several new fossil fuel projects that, over their lifetimes, would add another 2.8 billion tonnes of CO2 to the atmosphere, effectively cancelling out Australia’s 2005-2030 greenhouse gas abatement target twice over.